I arrived too late, too late for Dad to say a final “good-bye.” When I raced up the corridor of the hospital to my stroke-stricken octogenarian father’s bedside after an eighteen-hour drive, I realized that I was too late. The light had gone out in his eyes; he could not acknowledge my presence even if he were aware of me; the shades of his eye lids were drawn half-way down, and I sensed that he was no longer home behind his body’s gray-green stare. The man I had known for my sixty-plus years had unceremoniously departed a few hours before, felled by a stroke, although his breath still came paroxysmally in shallow and rapid gasps. It was small—and I must say bitter—comfort that millions of other “Boomers” faced the same scenario each year. Indeed, thousands I realized, were probably sharing the same experience at that very moment. I was glad that I had visited on a whim a few weeks before, but that, too, was little comfort now. The next week was unforgettable, even if excruciating. The transfer to the hospice facility, the execution of his “directive,” the vigil, the final breath, all shouted “mortality!” In those hours watching Dad’s body incrementally shutting down, I saw not him but me lying abed there, slowly sinking down with each breath, each feeble cardiac palpitation, until in the early morning hours of Good Friday, March 21, 2008, the vernal equinox, a day for turning to the light, although it could have just as well been the longest and darkest night of the year, at last we arrived—at stillness. Even as ugly as is death, I could not look away. I had ignored it until then, until it was impossible to deny, but then I was forced to look at it full face: I am inevitably my father’s son, son of Adam. Indeed, it is difficult to escape your genetics, and it is impossible to cheat death in the end. It comes on, welcome or not. In the year after his departure (“death” seems too harsh a word to utter even if it is all too real), I felt my own mortality acutely. I pondered the meaning and significance of Life, my life, in particular. I reflected on the rumors of a future hope, and wondered. I slipped into a perpetual sadness over the possible futility of human existence. I did not smile as often as before life and death had orphaned me. My typical bravado was shaken just as when, as I child, I bravely scaled the high dive ladder until the kid before me had taken his turn, disappearing over the edge of the platform, and I stood staring down into the depths below, a lump in my throat. I had suddenly realized when my children and grandchildren were assembled at a table per stirpes for thirteen that somewhere along the line I had imperceptibly grown into a patriarch, the elder son, a scion of a complete branch of our family tree. The realization was unnerving. I was helped somewhat by sympathetic friends and family, but the grief work was mine to do alone, since the only answers that are relevant to our deepest questions are the ones we discover for ourselves. Christmas came, the first Christmas without Dad. My eldest child Carrie and her family gave me a high-tech walking stick to use on our hikes in Colorado. She also included two books on theology, in recognition of one of my hobbies. Over the next few months these items came to mean more than I understood at first. Indeed, they bespoke that my life was not over; there are trails and other journeys that I have not explored. On impulse, I decided to give my walking stick a name and looked up the Mandarin characters on-line for “not yet finished.” Thus, I stumbled upon the phrase “Wei Yang,” a classic literary phrase, little used today, as I learned from my Mandarin-speaking friends. The elegant connotations of the ideograms suggest that life holds more possibilities in its unfinished-ness than we can foresee. 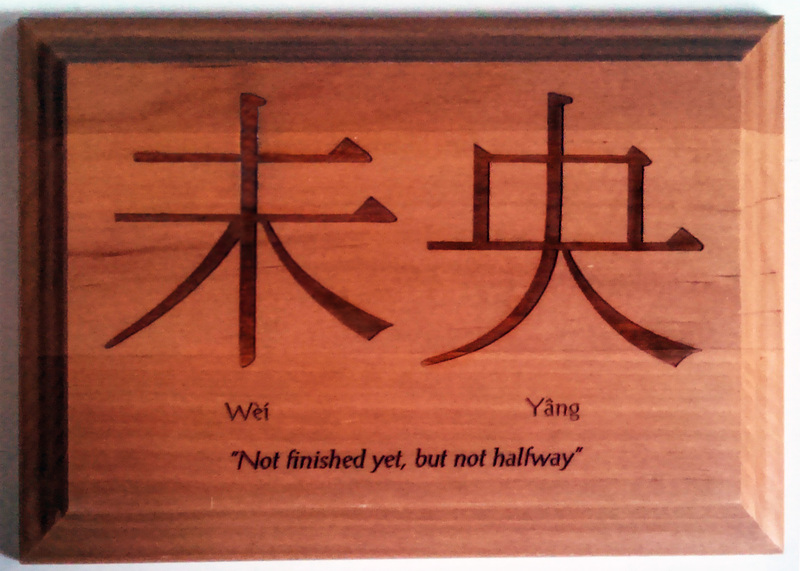 I prepared a wooden plaque with the characters in calligraphic form to remind me of this truth and to provide a daily encouragement, when quite by accident (or God’s providence) a Chinese student noted the sign and amended an insight. In an inexplicable way it is comforting to my spirit that part of the eternity of life is its unfinished, never done character. Indeed, when my days among you have expired I suspect that I will be on my way somewhere and must leave much unfinished. Until then, I will not sit and wait for the end. It must and will catch up with me on the way, as it did my father.